The following routes will be adjusted effective Saturday, April 13th, 2019. Where applicable, new schedules for Weekday, Saturday and Sunday/Holiday service have been created to accommodate these changes. 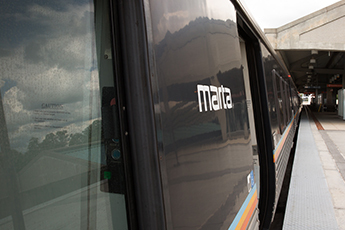 Please refer to the new printed service schedules, www.itsmarta.com or the MARTA On The Go app for updated maps and specific trip times. Still have questions? Call us at 404-848-5000, press 131 and speak with one of our Customer Information Operators. Trip time adjustments have been made to improve schedule adherence and connectivity. With construction complete, Route 8’s southern terminus will be restored to the Avondale Station south bus bay area instead of Kensington Station. Trip time adjustments have also been made to improve schedule adherence and connectivity. Trip time adjustments have been made to improve schedule adherence and connectivity. The route will be renamed 34-Gresham Road. Trip time adjustments have been made to improve schedule adherence and connectivity. The route will be renamed 47-I-85 Access Road. All trips will terminate at the UPS Distribution Center. Customers in Atlanta Industrial Park will now be served by Route 850. Trip time adjustments have also been made to improve schedule adherence and connectivity. Trip time adjustments have been made to improve schedule adherence and connectivity. The route will be renamed 103-Peeler Road. Trip time adjustments have been made to improve schedule adherence and connectivity. The route will be renamed 114-Columbia Drive. The 12:23 a.m. weekday trip from Tucker to Doraville Station has been eliminated due to low utilization. The 12:12 a.m. weekday trip from Windward Park & Ride to North Springs Station has been eliminated due to low utilization. An earlier trip from Windward Park & Ride to North Springs Station has been added. The new trip will depart Windward Park & Ride at 5:26 a.m. and is scheduled to arrive at North Springs Station at 5:45 a.m.
Trip time adjustments have been made to improve schedule adherence and connectivity. The route will be renamed 185-Alpharetta. The 4:36 a.m. weekday northbound trip has been added to the printed service schedule. The northern end-of-line has been adjusted to serve the Atlanta Industrial Park. Customers in Collier Ridge will no longer be served by Route 850. Instead, these stops will continue to be served by Route 853. Routing through Collier Heights has been discontinued. Instead, Route 853 will continue to Collier Ridge via Hamilton E. Holmes Drive, Donald Lee Hollowell Parkway and Harwell Road. In addition, service along Chappell Road in Hunter Hills has been discontinued. Instead, Route 853 will serve Hunter Hills via Holly Road, Ezra Church Drive, Chappell Road and Eason Street back to Holly Road. The route will be renamed 853-Center Hill.